Even in the spring sometimes you feel like a bit of comfort food. This is how I felt last night when I was deciding what to make for dinner. I decided that a creamy pasta dish would do the trick. Since I had ramps and scallions, as well as a bit of neufchatel, I thought a creamy sauce with those ingredients laced with lemon would be nice. Bucatini was the pasta I chose, because it is hearty and I love its texture! No Angel hair this time! I decided a bit of roasted asparagus thrown into the pasta would be a nice addition, since it is the season to be eating it! I could have simply served the pasta as it was with just its creamy self, but I decided to go ahead and give it a lovely pistachio bread crumb topping for a texture contrast! The dish ended up being delicious and the perfect spring comfort dish! If it is a rainy day in the spring, and you need some comfort, try this! Bring a large pot of salted water to a boil. Preheat oven to 450 degrees. Line 2 baking sheets with foil. Toss scallions, ramp bottoms (reserving tops) and garlic with enough olive oil just to coat, then spread out on one of the baking sheets. Toss asparagus with just enough oil to coat and spread out on other baking sheet. Place sheets in oven and roast until the vegetables are lightly brown and cooked through, about 15-20 minutes (probably less for the onions). Meanwhile, add pasta to salted water and cook according to package directions. Reserve 1/4 cup pasta water and drain pasta. Place pasta in a large bowl. When veggies are done roasting, remove from oven, and put asparagus in bowl with pasta. Place scallions, ramps, and garlic in food processor, along with ramp tops, neufchatel, lemon juice and zest, 3/4 cup pecorino romano and salt and pepper to taste and enough extra pasta water to make a creamy sauce. Pour the sauce over the pasta and asparagus and toss to coat. Pour into a medium sized ovenproof casserole dish. 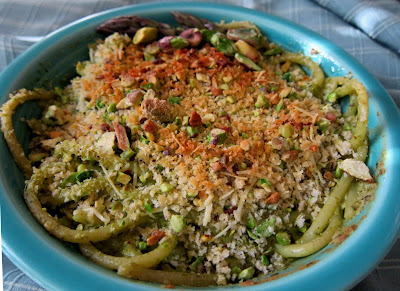 In another bowl, mix together the panko, pistachios,1/4 cup pecorino romano and olive oil. Spread the breadcrumb mixture over the pasta. Place in the oven and bake about 10-15 minutes, or until hot and breadcrumbs are lightly brown. Hi vanillagirl...what a delicious pasta...mmmm salivating as I am penning this down in your comment box :)) thanks for your recipe and btw you have a great blog. Hey Amy, I love Buccatini, and I do like rich comfort food even in the Spring, especially on rainy days. Nice dish! Perfect use for asparagus! Lovely dish!